Fly of the Month by J. Stockard Pro Tyer: Justin Aldrich, Haversham Co. GA, find Justin on Instagram and YouTube. It’s a pattern that has been done to death, understandably, and can be made to tie as easy or difficult as you choose without sacrificing production on the water if you need a quicker tie. On a side note, it’s often I tie and fish these without a dubbed Thorax or a Flashback Wingcase. If I do this, I always use a piece of tiny flash to rib the body and wire to secure the flash. But it’s just as effective and saves massive amounts of time on the vise. Dead drifted, Dry Dropped, Swung, Swam, Jigged, twitched, all ways to fish the Guide’s Choice series of Fly all because of the materials used. 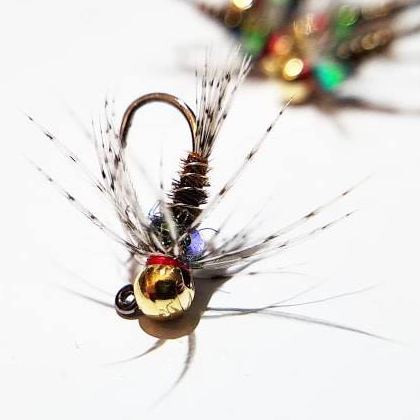 This entry was posted in Fly of the Month, J. Stockard Pro Tyers and tagged fly of the month, fly tying, fly tying instructions, fly tying materials, fly tying recipe on March 28, 2019 by Paul Beel.